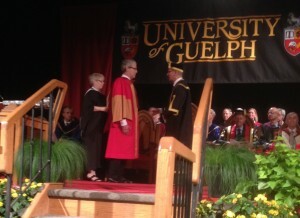 PSI Visiting Scientist Marc Mangel receiving an honorary doctorate last month at the University of Guelph. Dr. Mangel was awarded the Doctor of Science, honoris causa. He is currently working at the Puget Sound Institute to apply mathematical principles to the population dynamics of Puget Sound forage fish and other species. Read an interview with Dr. Mangel about some of this work.